Issues confronting black philanthropy in the U.S. 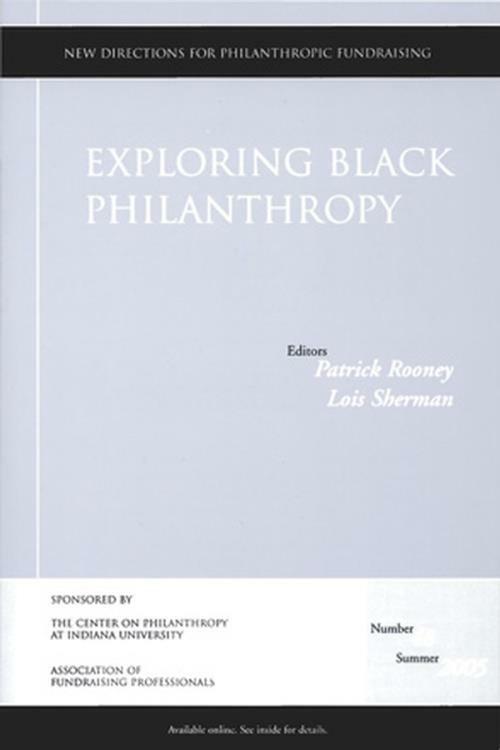 Exploring Black Philanthropy: New Directions for Philanthropic Fundraising explores the past, present, and future of black philanthropy to bring important issues into focus. Individual contributors examine giving through the lens of history, economics, practice, sociology, and constitutional law, with discussions on megachurches, demographics, wealth transfer, and more. Addressing the rise of the black middle class and the shift toward more comprehensive nonprofits and dissecting rich data sets, this insightful read clarifies trends in black philanthropy and suggests new directions for the future. Editors Notes (Patrick Rooney, Lois Sherman). The CEO of the Minneapolis Foundation offers two definitions of black philanthropy and a discussion of its nature as a concept that adapts based on its environment. Adherence to the three C s a common curriculum, a common code of ethics, and a comprehensively accepted certification forms the basis of fully professional practice in fundraising. This study of several dozen African American megachurches focused on social outreach programs, economic development investment, growth trends, spiritual and theological philosophies, and challenges facing the church. African American donors in the New York metropolitan area tend to be more affluent and better educated than the population in general. They also hold attitudes about philanthropy that are both similar to and sharply different from traditional approaches. The amount of wealth that will be transferred between generations of African Americans in the next half–century is limited by the reality of comparatively lower assets and a low rate of growth in wealth. Data on charitable practices, formerly lacking and now becoming available through the Center on Philanthropy Panel Study, are tapped for fresh insights on differences in the philanthropy of racial and ethnic groups. Faith–based organizations entering into government contracts for delivery of social services should be aware of the potential problems that accompany the benefits and of the three C s that require careful consideration: capacity, commitment, and constitutionality. In a call for a more inclusive model of black philanthropy in the United States, Copeland–Carson argues that the focus is too limited when black philanthropy is viewed only as the giving traditions of native–born African Americans. Descriptions of how ethnicity and cultural traditions affect giving patterns are extended to the practices of immigrants, whose giving is based on experiences in their country of origin. To win at hopscotch, a player cannot step on a line and skip a square, because all squares must be navigated sequentially. It takes a lot of skill and dexterity in order to win at hopscotch and at fundraising in the black community.